See the full phase one lineup. 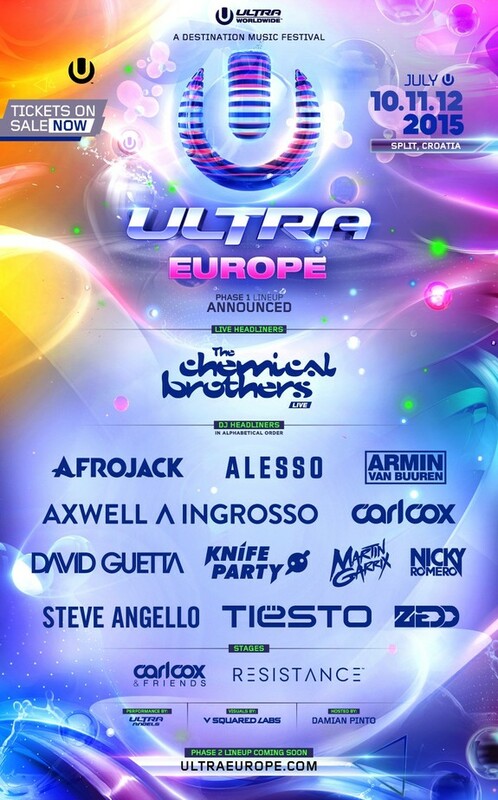 The Ultra Europe 2015 phase one lineup has been unveiled with Afrojack, Alesso, David Guetta and Tiësto all confirmed to play at the Croatian festival. Taking place on the week of the 10th July 2015, the festival will see Armin Van Buuren and Nicky Romero return to the main stage for the third year in a row, while Zedd and Steve Angello are lined up to make their first appearance. Other superstar DJs heading to Split, Croatia, include Martin Garrix, Axwell ^ Ingrosso and Armin Van Buuren. Last year saw 150,000 dance music fans attend the summertime event, a number which is expected to grow this year. The festival follows Ultra Music Festival in Miami in March. which sees a similar lineup of superstar DJs take the stage alongside some of the UK's biggest new acts including Clean Bandit and Gorgon City.